Casa de Las Palmas . . . like your own beachfront estate on the Sea of Cortez! Bienvenidos! Relax and enjoy “Baja time” at Casa de Las Palmas, a private, gated beachfront estate located on the beautiful blue Sea of Cortez in Baja, Mexico. The villa is situated on over an acre of land in a quiet, convenient neighborhood that is a 5-minute trip by car or quad to the center of Los Barriles. With 6-bedrooms and 5,500 square feet of living space, Casa de Las Palmas is one of the largest beachfront homes in Los Barriles and is perfect for large or small groups. We invite you to enjoy, relax, and unwind at our roomy family-friendly compound that sits on the edge of a white, sandy beach where you can swim, snorkel, kayak, fish, or paddleboard. The beautifully designed heated pool and spa with a lush landscaped deck area is fully fenced, gated, and protected with child-safety locks, an added benefit for families with small children. The pool area was designed to be enjoyed year-round and is protected and out of the wind, which is especially nice during the cooler winter months! As you enter the arched doors of the large, airy great room, your first sight is a gorgeous view of the Sea of Cortez framed by arched porticos and swaying palm trees. An extensive remodel in 2009 continued the elegant style of a sprawling single level traditional Spanish hacienda with private patios, outdoor seating areas, and large verandas with spacious dining areas. A wall of sliding glass doors on the beach side afford views of the sea from anywhere in the room. One side of the great room has a large, well-equipped modern kitchen with a dining area that seats 12 or more. Comfortable couches, chairs, and a game table provide a separate conversation area at the other end of the room where you can enjoy major channels on the satellite TV. Equipped with a DVD player, an Xbox, and connection for computer to television, everyone is sure to be satisfied. Connect to high-speed internet anywhere throughout the property, including the pool area and outdoor verandas. The main house has four bedrooms (perfect for a smaller group) with the two Casita bedrooms just across the courtyard. The house comfortably sleeps 12 - 16 people yet still provides privacy if desired. The bedrooms are furnished with king or queen beds and all have private baths, other than two bedrooms which share a large Jack n’ Jill bath. At Casa de Las Palmas, our fantastic staff will satisfy your every need. We have chefs who are available to cook for you on a daily or nightly basis. Traditional Mexican flavors combined with flame-grilled steaks, BBQ ribs, or grilled shrimp are always a favorite! Max handles our transportation and is one of several English-speaking drivers who can provide you and your group round-trip airport transportation in large, air-conditioned passenger vans. You will arrive relaxed and ready to start your vacation at the Casa. 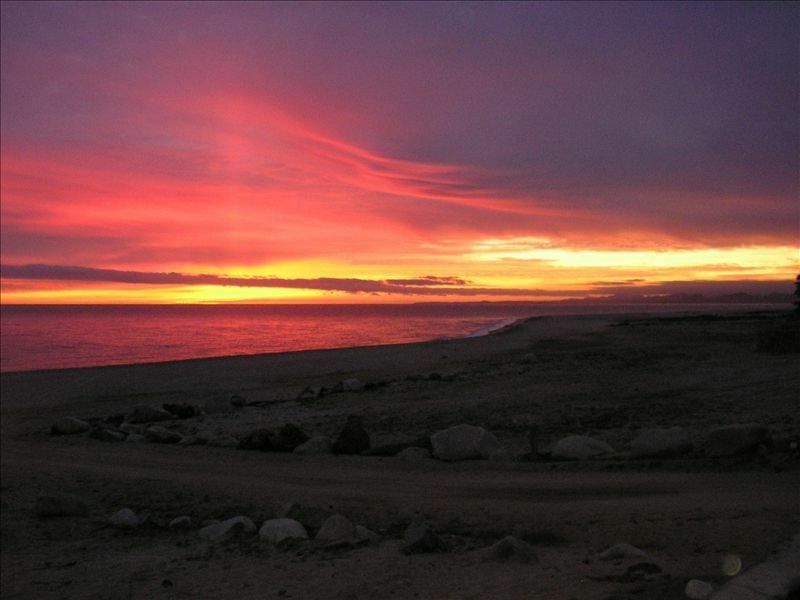 Before you know it, you will be in “Baja time” – a slower paced lifestyle where the days slip one into the next and daily cares become less important, where people are friendly, and life goes at its own pace. Remember, there is always mañana . . . so come enjoy, relax, and create memories of a lifetime at your home away from home . . . Casa de Las Palmas. 4-bedroom rates cannot be calculated with VRBO. Please email me for a detailed quote. The villa with all amenities is available on a weekly basis (4-night minimum stay) or for up to a month. You will find several excellent restaurants in Los Barriles, a Saturday market with organic fruits, veggies, and fresh baked goods, a deli, grocery stores, and tourist shopping just five-minutes away in town. With all of the modern conveniences available, Los Barriles still maintains the quaint charm of a small fishing village, which you are sure to love. Your hosts live year round in town and are more than happy to help you plan everything to make your time here as perfect and stress-free as possible. ATV’s and 2- or 4-seater side-by-sides are a great way to get around town and “live like a local.” (Ask about the discounts available to our guests.) These vehicles provide adventurous rides up the arroyos to picturesque waterfalls. In an excellent area known for big game fishing for marlin, sailfish, yellow fin tuna, and Dorado, there are many boats and crew available for day trips. We will be glad to recommend our personal favorites. Drivers and vans are also available for day trips, shopping, or other excursions. A day trip to Cabo Pulmo, a national marine park with one of the most beautiful reefs, is a great place for a picnic lunch where you can swim and snorkel with the sea lions and the many diverse species that inhabit the reef. During the months of December through late February/early March, kiteboarding and wind surfing are the sports “du jour” due to the on-shore north winds. A short walk south from the house will take you to ExotiKite Kiteboarding School whose friendly, experienced instructors are all IKO trained and certified. All gear and equipment can be rented through them and your personal instructor will have you up and riding the wind and waves in no time. We love the area, the weather, and the warmth and friendliness of the people here. We are fortunate to have found such a lovely property and are happy to share it with you and your family! Our home is 'front row' - on the beach! With all of the activities that come with that - dolphins leaping, whales breaching, fish jumping, gorgeous sunrises, privacy, space, private heated pool with spa, and all the tranquility that comes with staying at your own private retreat . . . on the beach. New bathroom at pool area complete with shower. 5 full bathrooms with large showers plus new bath and shower facilities at pool area. Ceiling fans in all rooms of the house. Air conditioning in all bedrooms. An ample supply of bed linens, bath towels, large beach towels, and beach mats. Bed linens will be changed for stays of over seven days. Full size washing machine in laundry room. Fully enclosed gated property with parking available on site. Password protected WiFi available throughout the property. Spacious open living area with 2 large comfortable sofas and additional chairs for seating. Dish network for all of your favorite shows, plus east and west coast US network stations. A collection of many different books. Assorted videos and DVD's (feel free to bring your own) with lots of Disney and kid videos. Enjoy the views of the Sea of Cortez sipping your coffee or drink or lounge on the many hammocks and patio furniture placed around the verandas. 2 new SUP's (stand-up paddle boards) on Baja wheels for easy access to the beach (rented separately by the day). A gorgeous new heated pool and spa set amongst a beautifully landscaped patio in a fenced and gated area (safe for little ones). Pool includes swim jets, wet deck/tanning platform, and jetted spa. Best family trip ever – perfect place to relax and play In all of our bear family adventures, we have never come across a more perfect beach house than Casa de las Palmas. We were a family of 12 (3 generations with 8 adults and 4 children under the age of four) – and the home provided the perfect retreat for each of us. The property has something for everyone and provides space, privacy and comfort across the board. We particularly appreciated the family friendliness. We felt secure with a gated property that kept the children from wandering onto the beach or off the property. Additionally, the pool is child-proofed with an incredible shallow lounge section perfect for accompanied kiddos to take a dip. The homeowner also provides games for children (video games, Disney movies, beach gear and even a train set) and adults (snorkel gear, ping pong, satellite TV and internet). More importantly, the natural beauty and nearby outdoor activities (steps from the back porch) kept us busy and having fun. We stand-up paddle boarded every day and the marine life just outside the home is incredible – schools of fish, manta rays, dolphins, tortoises and more! The views from the common areas and patio are unrivaled. You can see clear waters, white beaches and mountains in the distance. On several occasions, we saw dolphins and tortoises in the ocean from our patio. The layout of the house is perfect for multiple families. There is a grand common area with huge patio and views, and comfortable lounge furniture to relax and enjoy the sun or shade. The bedrooms are organized in 3 wings. The main common area includes a bedroom and bathroom. Additionally, there are 3 bedrooms and 2 bathrooms connected to the main house by covered patios. Finally, there are wonderful casitas (2BR/2BA) with a covered patio overlooking the pool – and across a cobblestone walkway from the main house. The beds are comfortable, and the owner provided 2 cribs for our infant children. Finally, the homeowner went above and beyond to be sure we had a great time. She arranged for us to hire local chefs to prepare every lunch and dinner (much better value than eating out, and much less stressful than cooking in). Additionally, she connected us with local companies for fishing excursions (we were picked up by a boat at our house), ATV tours (pick-up and delivery at our house – an awesome adventure) and spa treatments. Every day we took on a new activity – and also found time to just relax at the great private pool and beautiful beach at the home. Our week at Casa de Las Palmas was just wonderful. We had 13 people in total and used the main house, casita, and the new bungalow. We had plenty of space for everyone, and the teenagers enjoyed having the bungalow to themselves. The view of the sea is breathtaking. We saw rays jumping in the air each evening and even a couple of pods of dolphins. We visited during the last week of March and had great weather in the 80s. I won't repeat all of the great amenities that other reviewers have mentioned, but I couldn't think of anything else that we could have needed while we were there. We opted for the chef services for breakfast and dinner for several days. The food was delicious and it was so nice not to have to worry about preparing meals and cleaning up for a large group. The location was perfect, the house itself was lovely, and we were able to really relax and enjoy our family time together. Thank you Mary! We are looking forward to planning another visit! We were a group of 10 men fishing and stayed at Casa de Las Palmas for 5 nights. What a joy it was to stay so close to town and the beach. Mary welcomed us with a fantastic dinner on the patio of tostadas, chili rellenos and the chefs even prepared fresh sashimi of our fresh Tuna caught earlier in the day. She split all the kings into twins so everyone had their own bed, and had daily housekeeping. The house is every bit as nice as the pictures. Very well stocked and Mary was available for anything we needed. I would recommend Casa de Las Palmas to anyone with a large group...she just finished another bungalow that has 8 bunk beds, 3 sinks and 2 bathrooms. This house is perfect for large groups! Mary's house is well kept and lovely! Casa de Las Palmas was perfect for our extended family, which included 2 young children. The pool area and jacuzzi are lovely (and perfectly gated for the little ones)! Mary's driver as well as her recommended chefs were top notch and we very much enjoyed the meals they prepared for us. The wifi wasn't great, but Mary is working hard to upgrade and fix this. All in all, we had a wonderful week here. Beautiful property, can’t wait to go back!! We had a wonderful super bowl weekend... a fantastic welcoming dinner,,, top of the line accommodation... will definitely stay again. High light was having chefs (3 of them) come in and cook dinner. A fraction of the $ for a restaurant, and infinitely better quality - such as 1 day old marlin carpaccio. We spent a magical week with family and friends at Casa de Las Palmas. It could not have been more ideal. Plenty of space for families, private pool and hot tub (and it's actually warm which is novel for Mexico), gorgeous beach front property and an incredible staff to make our stay a true vacation. The shuttle service was comfortable and reliable and the food was absolutely delicious. Mary was responsive, super helpful and incredibly kind. Thank you for a week in paradise! 4-BEDROOM Rate: $680/night Regular Rate (minimum 4-night stay) All rates are in US Dollars. Cancellation policies are outlined in the Rental Agreement. Rates are subject to change until reservation is confirmed. Maximum number of people allowed is 16. Pet fee: $150 and with prior approval of owner.